It’s easy and headache-free– download the program and install it. Then use your license to activate the software. As with all Ashampoo products it will be necessary to create an account with them, but this is painless and you can always opt-out of their newsletter if that’s what you want. For a clean and fast PC without unwanted programs, toolbars, plugins or Windows apps! Ashampoo UnInstaller 8 improves on the strengths of its predecessor! New profile-based uninstalls help completely eliminate unlogged or convoluted installations and system-default uninstall procedures have been augmented with automatic deep scans. The new drag and drop feature allows for instant uninstalling of applications while the integrated file wiping technology permanently deletes sensitive data. All cleaners have been updated and support for Opera has finally been added! Discover a more vibrant user interface with more useful details and speedier work flows and rid yourself of unwanted programs once and for all! Windows only deletes what default installations mark as deletable – and that is very little! Leftover files, Registry entries or invalid links frequently remain after default uninstallations. These frequently cause errors or system slowdowns. Thanks to sophisticated search and cleaning mechanisms, Ashampoo UnInstaller 8 locates and eliminates leftovers down to the last byte! Unsafe, unwanted and malicious plugins are present in millions of browsers. Though disguised as nagging toolbars or seemingly helpful add-ons, Ashampoo UnInstaller 8 finds them all! Track down extensions that manage to stay hidden from your browser, review them easily with the help of built-in ratings and get rid of them if need be. Every Windows installation comes with various default apps that are often hidden and not easily removable. Retake control of your Windows with Ashampoo UnInstaller 8 and get rid of those unwanted applications! Ashampoo UnInstaller 8 creates logs that fully document program installations and guarantees program removal without leftovers. Nothing can hide from the installation monitor. Installations that weren’t logged can still be efficiently removed thanks to a smart deletion mechanism. An in-depth cleaning algorithm ensures that no longer required files and entries that would otherwise remain on your system will be deleted without exception. Snapshots give you a powerful tool to understand even the most complex installation procedures. By comparing two snapshots (before and after states), the program can detect even minute changes to your machine. Whether you want to know which Registry entries were created or where data was copied, you’ll find every information neatly arranged and clearly laid out in this application. Fans of previous versions will be happy to hear that you can also merge two snapshots to create a more complete installation log! Modern software frequently relies on nested setups that install several programs in parallel and this is where many competing products fail. Ashampoo UnInstaller 8 will never fail you! Even the most complex of installations can be undone in a flash and step by step. You decide what stays and what goes! Note: If you have questions about using this program, Ashampoo has provided a Manual And Help Page to get you going. It is one-click accessible from within the program. 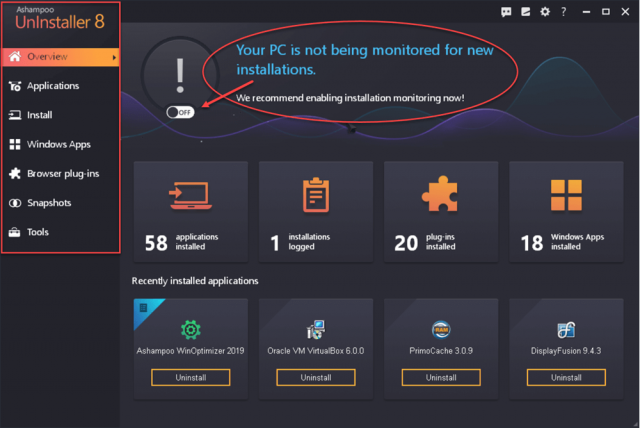 First off, you will notice a reminder at the top of the screen that says, “Your PC is not being monitored for new installations.” You can use the indicated Toggle Switch to turn this feature On or Off. If you are the type of person who is constantly trying out new software, then this option is for you. 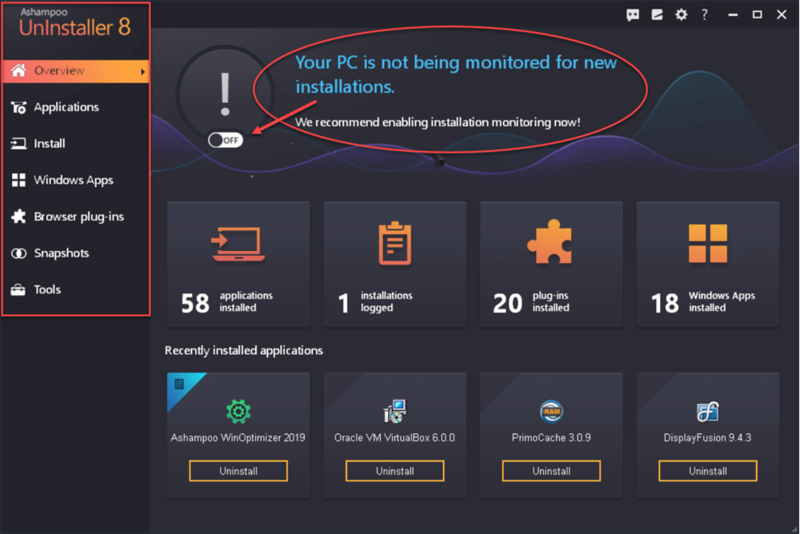 UnInstaller 8 will monitor your computer activity for signs of an installation, and if it detects this, it will offer to log the installation for you. By doing so, the uninstallation of said program will be totally complete if you later choose to remove the program from your computer. This can also be done manually if, like me, you don’t need an extra background program running. As you can see there are three plug-ins selected and ready to be removed. This is but one example of how quick and easy it is to use UnInstaller 8. In the left panel is a duplicate list of the previously-mentioned categories plus one called Tools. The Tools section includes many extras including but not limited to: Drive Cleaner, Registry Optimizer, Internet Cleaner, StartUp Tuner, and the list goes on. You will find all the details for each section at the aforementioned UnInstaller 8 Help Page. 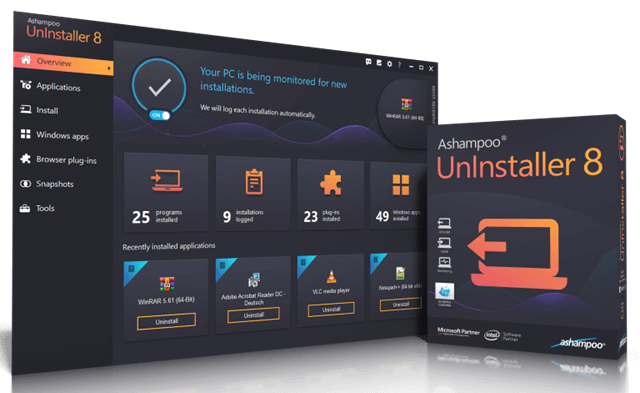 Ashampoo UnInstaller 8 makes complete uninstallations, both individually and in bulk, as painless as possible. You also get that warm fuzzy feeling from knowing that all the hidden, useless, superfluous, and dysfunctional elements will be removed as well, unlike the inadequate Windows uninstaller. I have been using various versions of an Ashampoo UnInstaller for several years and can wholeheartedly endorse this fine program. We’d appreciate it if you’d take a moment and submit a comment telling us why you’d like to win Ashampoo UnInstaller 8. However, submitting a comment is not required to enter this contest and will have no bearing on your chances. 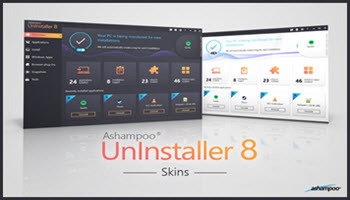 Enter to Win "Ashampoo UnInstaller 8"! Perfect timing. Revo informed me that lifetime does not mean lifetime – it means two versions. I have been using Ashampoo Software for 13years, with no issues. Highly recommended. Thanks for the offer. My current uninstaller is very subpar. Ashampoo would be a huge improvement. Mucho thank you for this offer. I really like that it makes it possible to remove hidden Windows apps and browser extensions. This looks like the uninstaller I’ve always wanted to have. Thanks. Great program to uninstall programs, and clean traces. Looking forward to using a program that is better than what Windows has always provided. time to remove junk files. nice offer. Thanks for the chance to win some nice software!